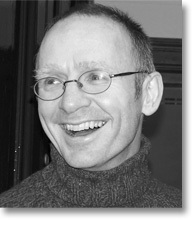 James Robertson is a poet and novelist, founder of the pamphlet imprint Kettillonia (www.kettillonia.co.uk) and general editor of Itchy Coo (www.itchy-coo.com), the Edinburgh-based imprint publishing books in Scots for children and young people. His novels are The Fanatic, Joseph Knight and The Testament of Gideon Mack. He is currently working on a fourth novel. He stays in Angus, Scotland.